OXFORD, Miss. 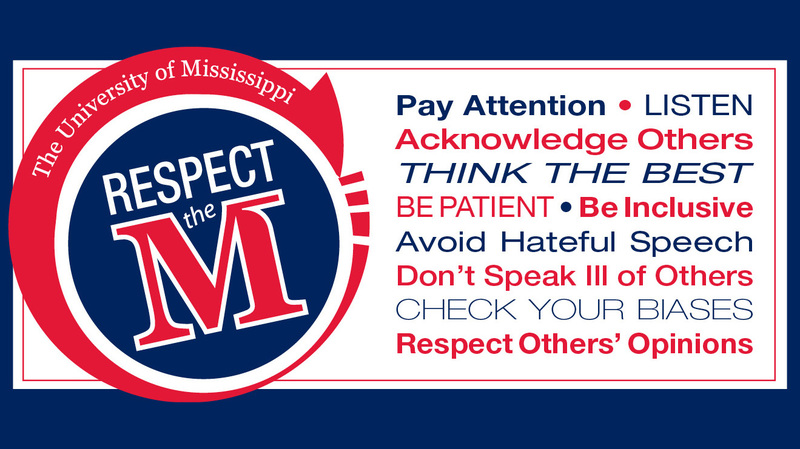 – Helping increase cultural sensitivity and inclusiveness at the University of Mississippi, the Multicultural Affairs division of the Office of the Dean of Students is promoting the Respect the M campaign. Students are supporting the Respect the M campaign by distributing bookmarkers, stickers and other items that highlight the 10 main principles of the campaign. Stickers and buttons are available in the Office of the Dean of Students. Students are encouraged to wear the items this week as a sign of support and respect for the diversity of the university community. The 10 guiding principles of Respect the M are: pay attention, acknowledge others, think the best, listen, be inclusive, be patient, speak kindly, don’t speak ill of others, do not harass people and respect others’ opinions. These pillars are being incorporated into all educational and promotional materials. The message of Respect the M is a product of collaborative work between Multicultural Affairs in the Dean of Students office and the William Winter Institute for Racial Reconciliation. 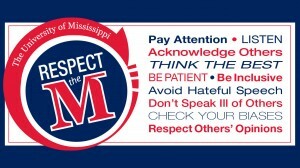 For more information about the Respect the M campaign, contact Valeria Ross at vross@olemiss.edu or at 662-915-7247.